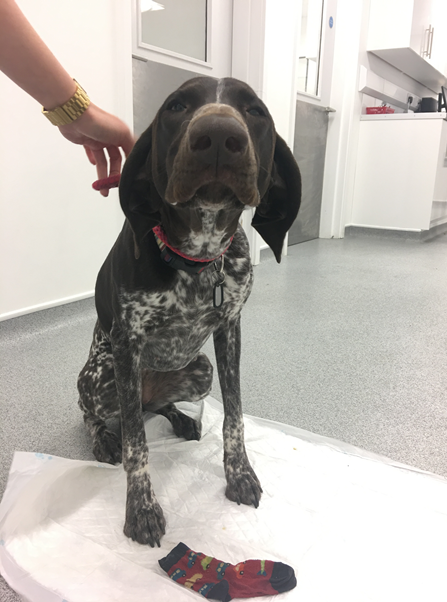 Mojo came to The Vet Nottingham as his owner was reasonably sure that Mojo the pointer had eaten a sock! His owner said that he may have eaten it the previous day. At presentation he was absolutely fine and in no discomfort what so ever. The sock, if it in fact had been eaten, could probably still be sitting in the stomach but could cause all sorts of problems if going through the bowels such as obstruction and peritonitis. It was decided to inject Mojo with a substance to make her vomit and only a few minutes later, much to our and the owners relief, she brought up a beautiful kids sock. Don’t do that again Mojo!